For a little bit of area history, stop by Camp Beale Springs, but pick up the free permit to enter it from the city first. It is available from the Powerhouse Visitor Center or the City Parks Department at Centennial Park and mine came with a rough map of the area. Parking is not signed, but is across from Wagon Trail Road a little before the signed parking for Camp Beale Trailhead. Parking and gate for entry into Camp Beale. 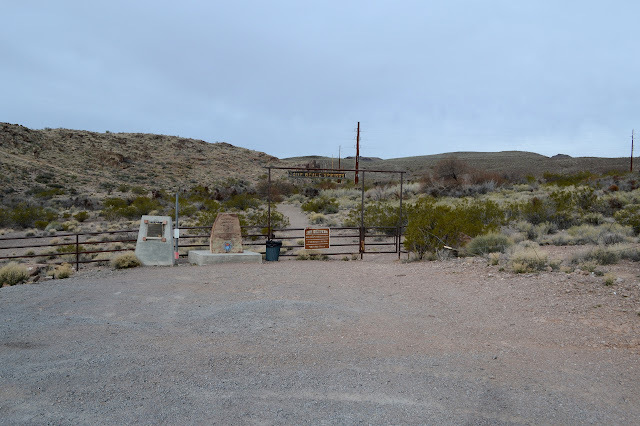 Monument plaques sit to the left, one for the Hualapai people who were collected here and one more general. It all revolves around the spring of course. It was a stop on a toll road in 1865. 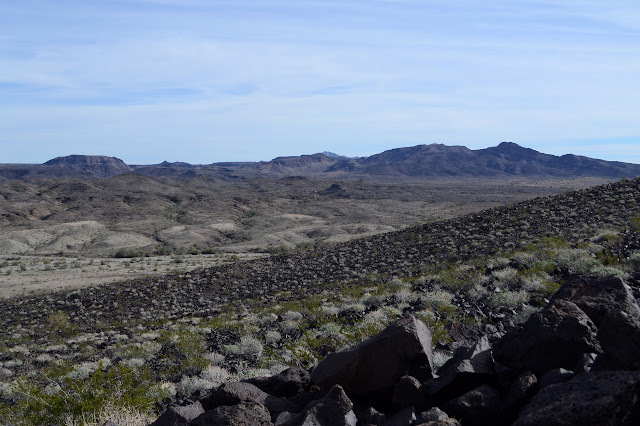 It was an army outpost during the Hualapai War 1866-1870. 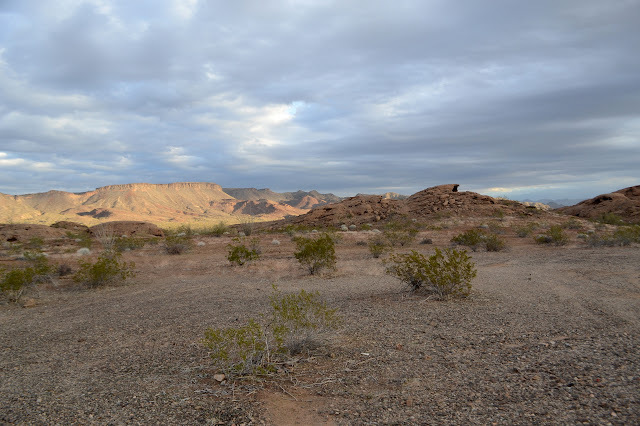 The camp was established in 1871 as it became a "temporary reservation" for the Hualapai Indians 1871-1874. As that follows on the heals of a war is is followed on by a forced march, the wording "internment camp" on the other monument might be a little more accurate. After that, it is the water supply of the growing city below and mining and agriculture in the area. The reservoir is one of the few things remaining. 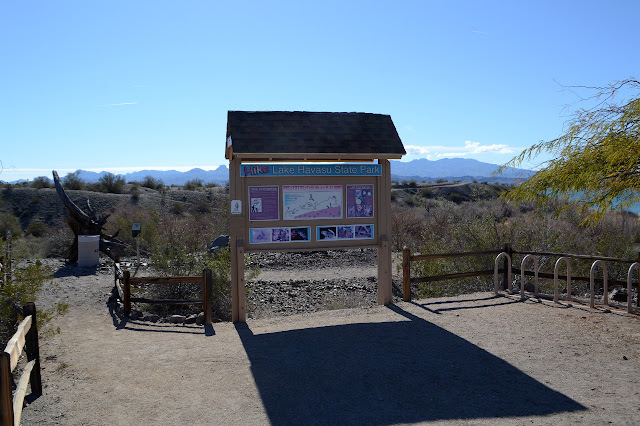 The recreation area continues on the far side of the highway (and future I-11 corridor) so I went over to the Camp Beale Trailhead to check that part out. There is a connector under the highway, so all parts of the trail system are available no matter which trailhead is chosen. It is a couple miles between these two via the connector, and they are the closest together of the four available, so it is nice to choose the right one. This trailhead is much smaller and someone has destroyed a large sign that probably once held at least a little good information. At least the trash isn't overflowing. The monoliths from yesterday sit in the distance. A bit less information at this trailhead. I head out around the loop to the left this time. That way passes near the actual Camp Beale area which is accessed from a lot a little closer to the highway and requires a free permit from the city to enter. (Get it from the Powerhouse on old route 66 if going there.) As it runs into the connector, there is another sign and this one is in much better shape. It has fire restrictions from 2005 taped up in the corner, so doesn't get a lot of attention and the trails it shows have been added to since it was put up. The map at Coyote Pass is closer to complete. Nice new trail signs do help point the way. They don't happen to point out where Rattler is and my map suggests that maybe I should try going down the unmapped road, so it takes me a moment to find it just a short way further down the loop. Found my trail wandering up a hill. Up and over a hill, there is supposed to be a spring somewhere. I can see the well below it, but not much indication of spring. Climbing up the next hill doesn't help much, but eventually I can get there. I should have just gone up the creek bed between the hills to find it. It isn't much to look at. I wonder at the stacks of rocks along both sides of the canyon above it in long, purposeful looking lines. Perhaps to keep the cows out. It isn't doing it just now. The rock walls on either side of the canyon. 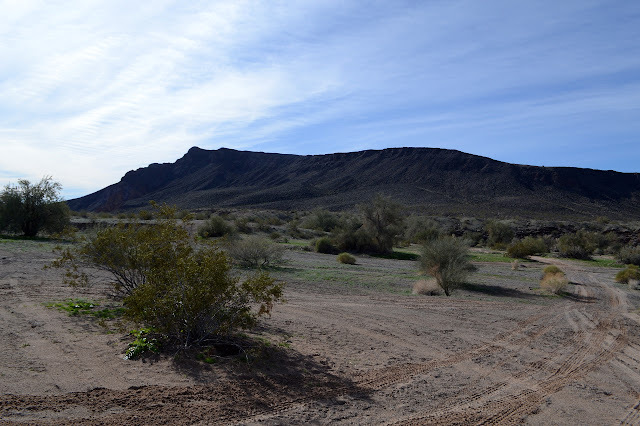 There is an extensive trail system at the edge of Kingman, Arizona, and so I am off for a general exploration of them starting at the Coyote Pass Trailhead. This trailhead is only accessible from the southbound lanes of US-93. There is a right hand turn lane, but little indication what it is for. There is a huge lot with trash cans and signs at one end and a bathroom at the other. 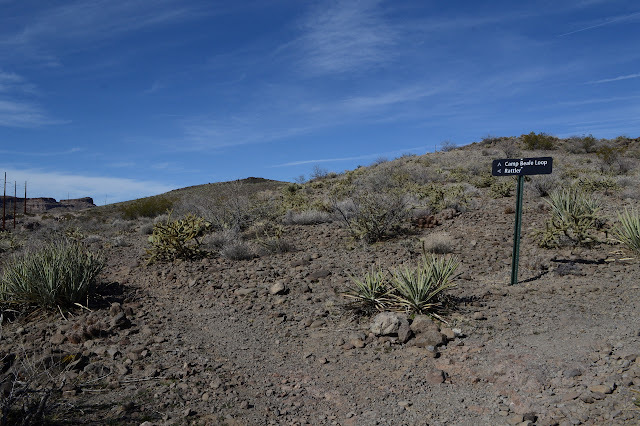 The signs indicate that the trails are on a mixture of federal, state, county, city, and private lands and is generally run cooperatively between BLM and the city. Oh, and trails are maintained by the local mountain bikers. It sounds quite complicated to get set up, but they managed it and now there are trails for all to enjoy. 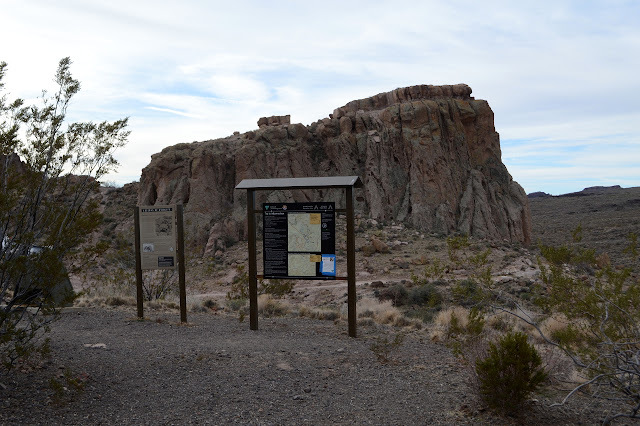 Signs at the trailhead and one of the monoliths in the garden. I head down the trail in front of me toward something interesting. It looks like someone carved a door into the side of a particularly large air bubble in the rocks to make a store room. 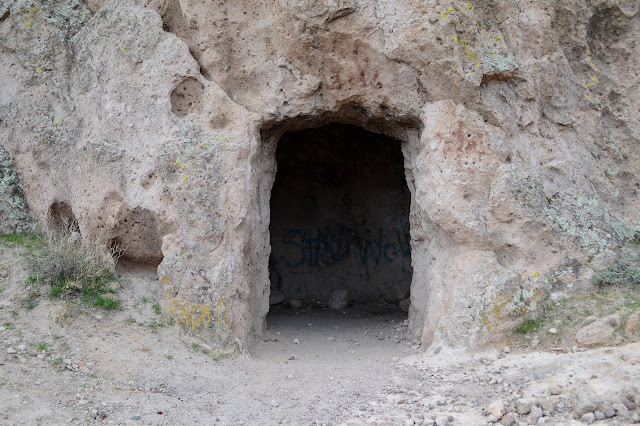 There is some hint of hinges in the past, but now it is covered in graffiti, so rapidly becomes less interesting. The doorway at the bottom of the monolith. 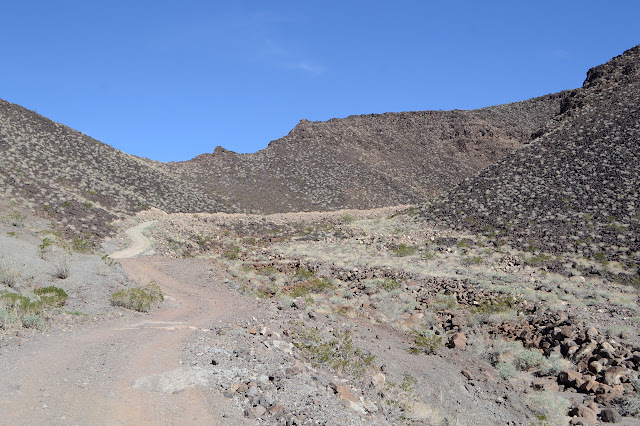 The trail runs into an old road at the bottom of the monolith and follows it around to the right. 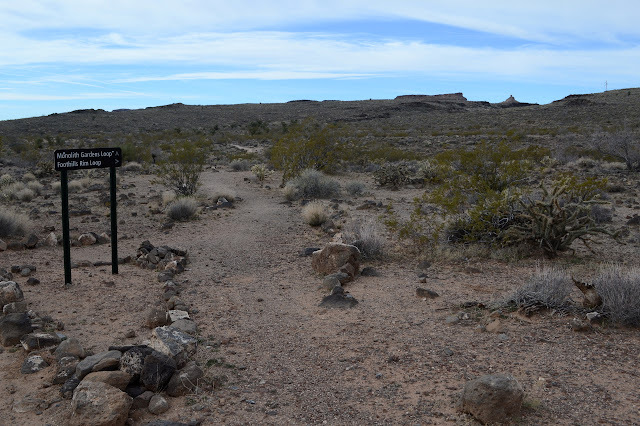 There is a register and signs pointing the way as the trail divides for the Monolith Gardens Loop. They look rather new. I take the right, leaving the road, and soon there is a second junction. This one confuses me since it says it goes back to the trailhead, but I had seen a trail that wound along the other side of a small canyon and came up around the back. 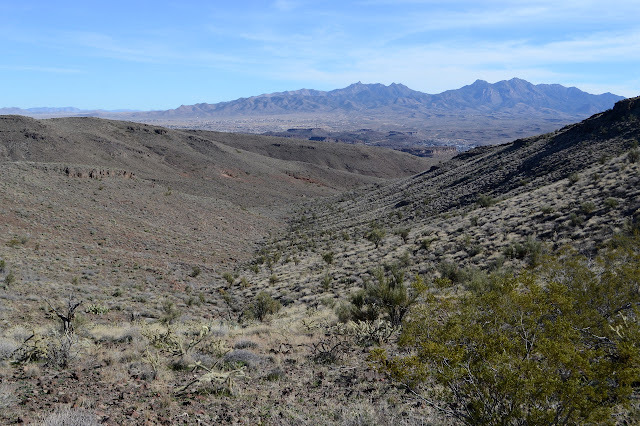 Soon after that is a third junction which I am looking for: Foothills Rim. I take a right again with a promise of easy climbing. This way for Foothills Rim Trail. Easy climbing does not even begin to describe what the trail does. I'm not certain it is climbing at all, but it certainly uses enough switchbacks to do it. I start wondering just how drunk the so-and-so who laid this thing down was when he did it. Maybe it's because the moment the trail turns the least bit upward, it becomes a watercourse when the intense summer storms hit. Maybe it's because the mountain bikers got to choose and they figured the longer route would be more fun. One way or another, this trail has gotten excessive in its attempt to climb while never actually going up. 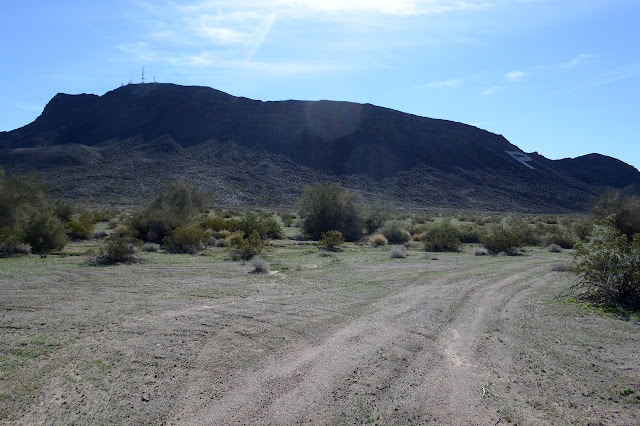 Of course, if I really wanted to go up, there's Hualapai Peak with a little bit of snow on it. It is one of those very high prominence peaks. Somehow it does climb. The previously hidden city comes into view, particularly some industrial areas. Off to the south, there is a handful of windmills. 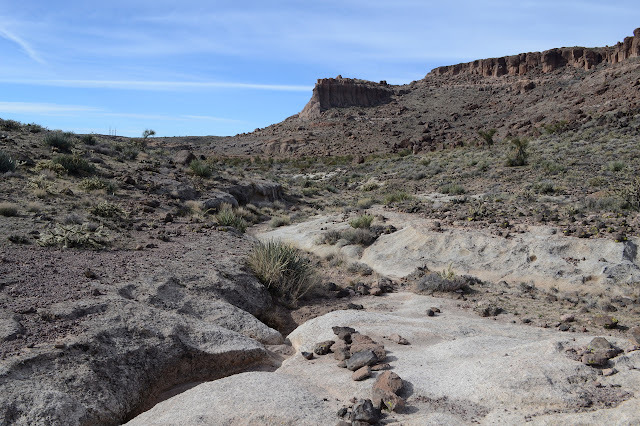 Above, the high mesas get closer. Or monoliths. Whatever. The trail takes a sudden swing off to the side gaining yet more mileage, but this turns out to have a purpose of standing for a moment at the edge of a huge canyon before swinging right back to its previous slow climb. 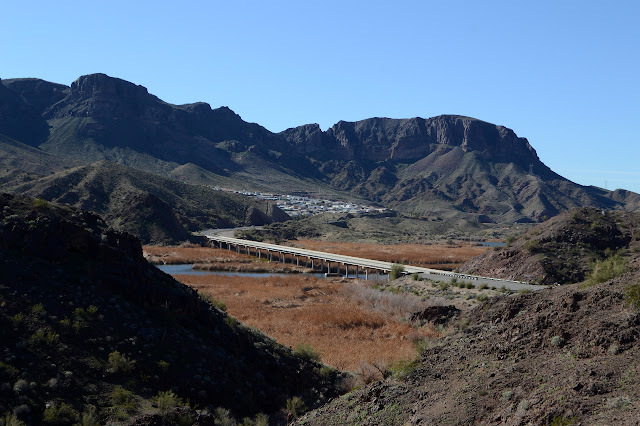 I stopped at the view point beside the highway to hike out a short way to sign a cache, but it is really an excuse to see a bit of the Bill Williams River. 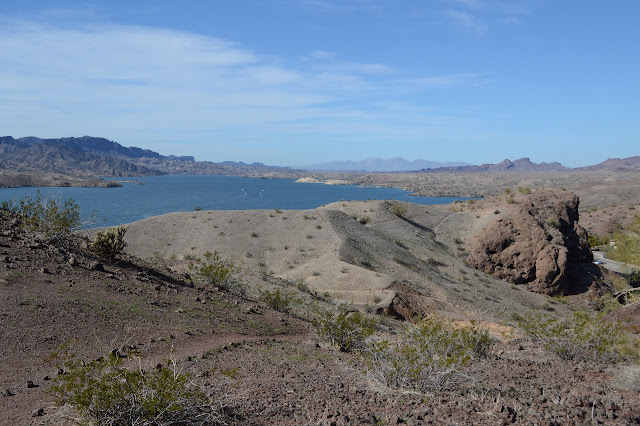 It has probably changed a bit with the damming of the Colorado River that makes Lake Havasu. That dam is only a little further down the river and so this one has been flooded a bit too. Outside the channel seems to have filled in so that now reeds grow thick. Around the edge is a border of tamarisk. There are not too many birds in evidence at the moment. I quite like the mountains rising from it. Looking out over the river from the roadside view point. The geocache I am going after is actually 0.56 miles off. 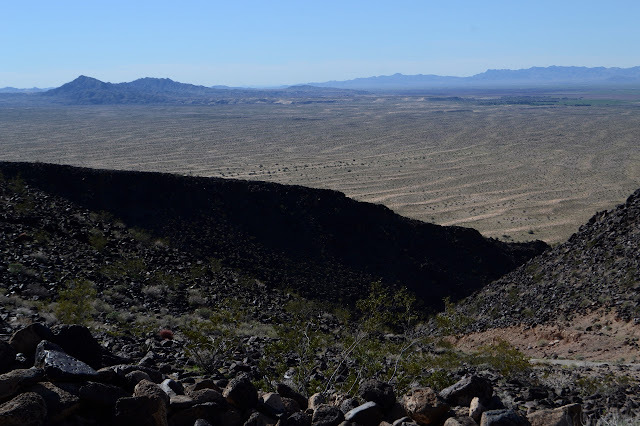 Not very far, but it is across a few narrow, steep sided canyons. The direct route would be difficult to actually hike. 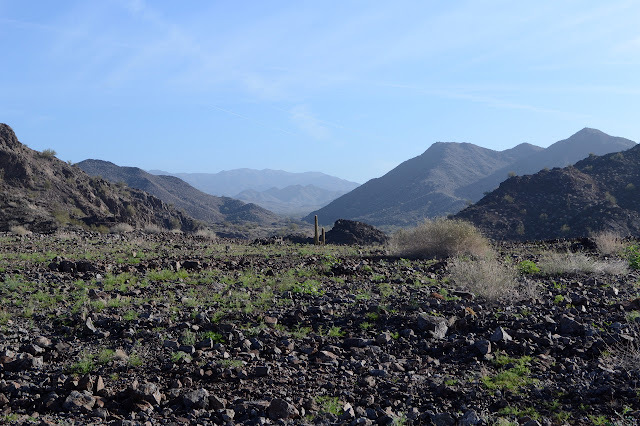 The reeds look flat and easy, but in spite of their brown color I am rather certain that there is probably water or at least miserable mud down there and the tamarisk around the side are large, well established, and thick creating a difficult barrier. My plan is to follow the ridges, smoothly up one part and down another. They don't look too bad. 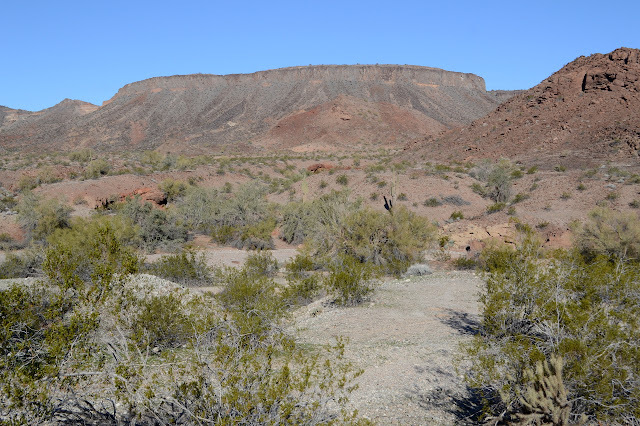 But I seem to need to prove to myself that the direct route would be difficult and end up scrambling down one side and up the other of a very small canyon. It involves a jump down and a crawl up a crumbled water course. Up close, the tamarisk look particularly impenetrable. Short, intense downs and ups are involved in crossing even the smallest of canyons that run through here. So up the ridge I go, quickly picking up trails left by whatever animals can be found here again. They are also quite partial to following the ridge lines and I suspect they know something. So I go up and up. It is pretty easy, but I am still 0.51 miles away after 0.75 miles walked, so quite a bit longer. A bit of the stubby hills. Easy enough to follow ridges here. Looking back to the highway, bridge, and view point. Back at the bottom of Black Peak and out to conquer it after my defeat a few days ago. It will be a bit of a hollow victory because I am now approaching it via a route that is much easier than the crumbling class 3 climb I aborted almost before it began previously. I'm just going to take the road up. Everyone is doing it, at least everyone who has registered their ascent on Peakbagger. Back at little Black Peak. This side has a big "P" for Parker on the side. I park off the road where it is curving back to east-west next to a "no camping" sign and what is probably illegal road. Somewhere to my left should be the actual road that ultimately makes its way up to the top of the peak. I head off cross country sort of angled to eventually run into it. It is hard to miss when I come to it, although I take it for a wash as I approach. 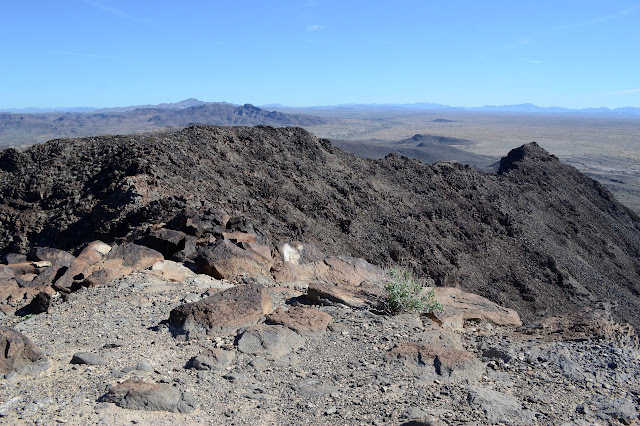 The footing on it is much worse than in the surrounding desert, so I do more following near it than on it before cutting my way up and over some low hills and down onto the spur that does the actual climbing. 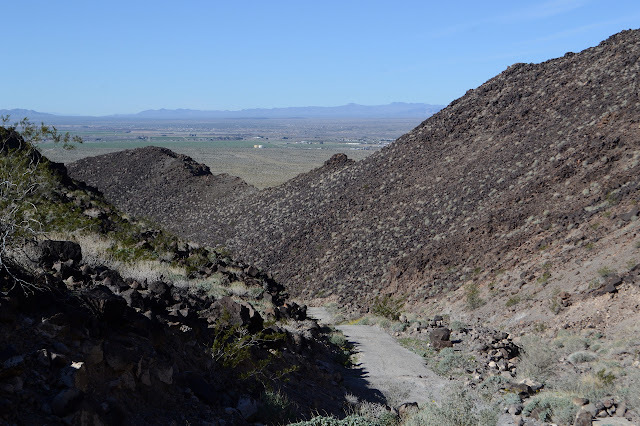 The road up the mountain follows a large wash that cuts down the side. 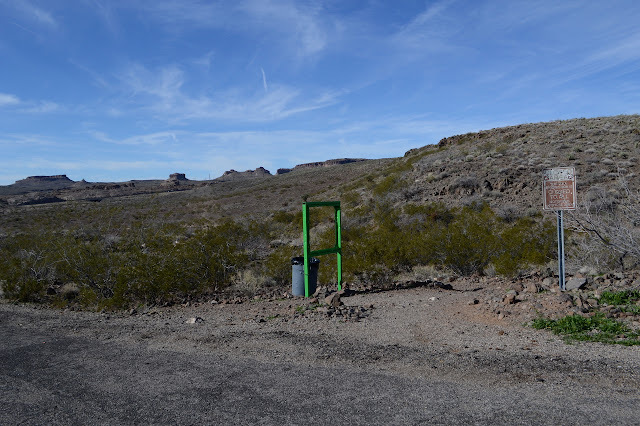 Someone once at least thought about putting in a gate to block vehicle traffic up to the top, but there is currently nothing more than two posts. Past that, the road is mostly paved in concrete. There is a slap-dashed quality to it and one bit that was driven through while soft was simply left that way. Frequent ditches have developed across the width. In spite of the paving, this is not a road you would want to drive your car up. Getting a little bit of Parker into the view. The flats out there look like they've become a huge washboard. Today is to be a bit less directed than the previous hike, just letting the local hiders of geocaches be my guide with maybe some excursions for a benchmark or Mineral Hill or corners or whatever. The geocaches purport to lie along a loop of road although one lies further afield. One part heads north at the end of 2WD travel according to my map. I'm not sure how this road will look after some rain, but it has been worked recently and is good as far as is indicated by the map right now. For the caches, there seems to be a recommendation for 4WD, high clearance, short wheel base, and avoid weekends for less potential of meeting anyone coming the other way on a narrow rugged road with few pull outs. None of that worries me for walking. Starting up toward that massive mesa area that was seen roughly north of Planet Peak. The road does not actually seem uninviting until it starts down to cross the area's major wash. Some people get distracted and drive the wash instead of the road. It looks like the placers of geocaches got distracted too because the first one is also down the wash a little way. 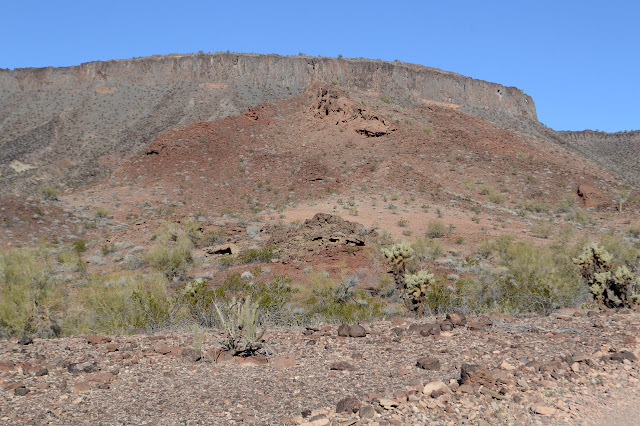 It shows off a startling bit of red that runs through this mountain. Much of it is reddish, but this particular spot is like dark bricks. The wash still has some puddles from the last little rain. The road roughens as it begins to climb. A bit of cliff edged mesa. The next cache is somewhere up on the mesa up ahead where the road does not go. 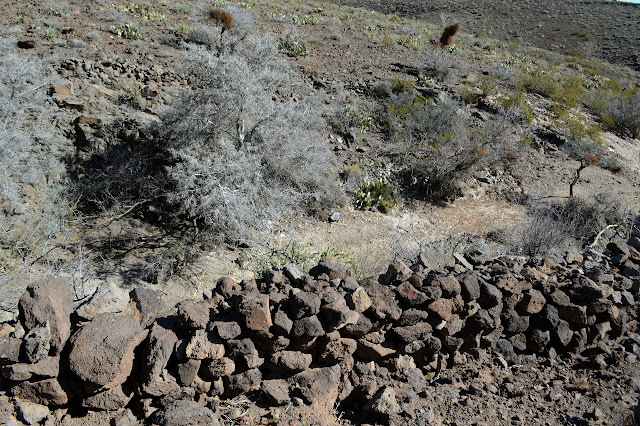 The hider indicates it is only a walk, not a climb, to the top where there are cactus gardens. To the "top"... The wall looks rather unbroken and is certainly not a walk. At the bottom of it, there are bunches of cactus. Some people call the end of travel upward the top even if it isn't actually the highest place. 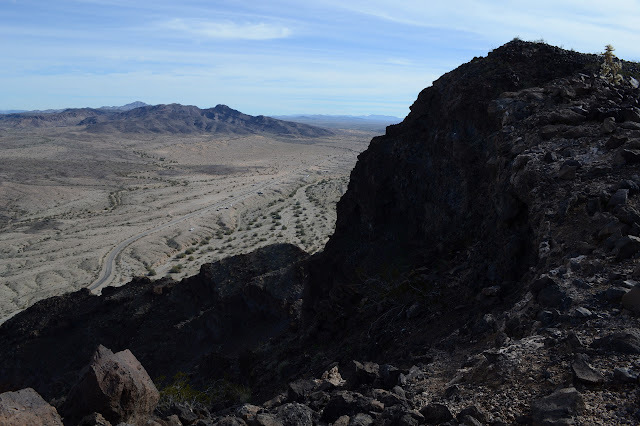 I don't have the cache mapped well enough to say one way or another, so I take the gamble that it is below that all too smooth wall and start up a ridge line in roughly the right direction. 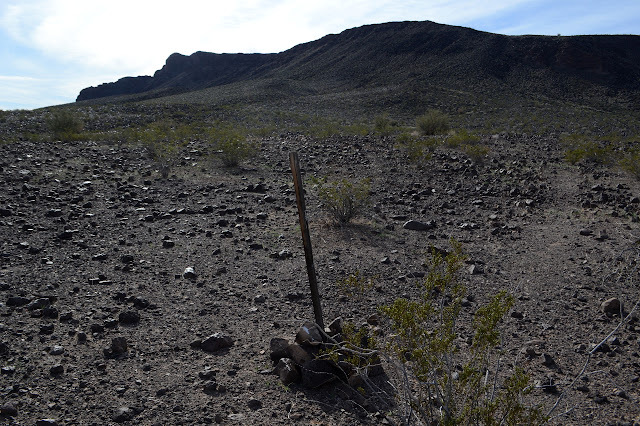 The little ridge seems to be covered in claim markers. Climbing the ridge looking back at Planet Peak out across Mineral Wash. Looking down on the climbing road far below. Note the gaping hole of a huge mine at the far left. Unfortunately, I'll end up missing that one. 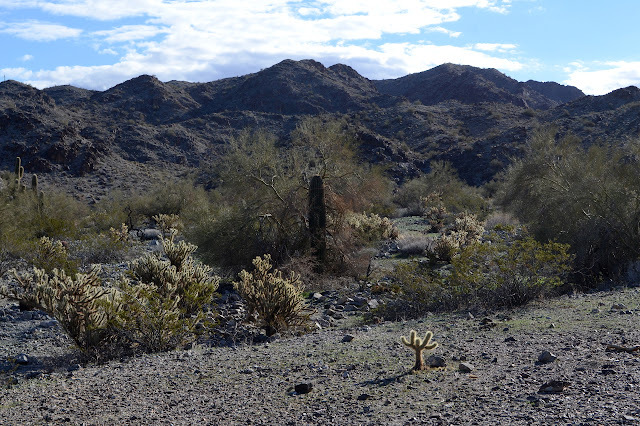 The cache location takes me to a spot that is indeed at the edge of one of the clusters of teddy bear cholla and about 20 feet from a saguaro cactus at closest approach with a hint about a "lone log". 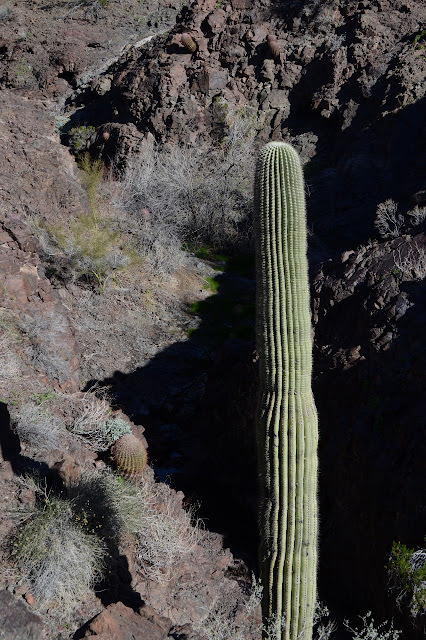 The saguaro does seem to be the only one of its kind on this particular hillside. Unfortunately that closest approach is still 85 feet off. I do what I should have done earlier and drop the cache location on a better map. It is definitely up on top somewhere. The wall does have fissures through it. Maybe it really is climbable. I decide against investigating too closely. I do not even want to be tempted to do such a foolish bit of climbing. It says it's a walk, I will find where it is. Under the cliff, there is something like a walkway, so while not simple, it is also not very complicated to work my way around the edge looking for an easier route up. It is actually a little more troublesome than I expect to move along this way, but I notice that the route back down seems to be improving. Even if it doesn't work out to find a way up, it will work out to make an easier escape. The wall gets higher and smoother before it finally relents a little and then enough to walk up as promised. The cactus garden at the top is not much more than the bunches down the sides, but the log is a little more literal and I can add my name as the second finder in a bit more than 2 years. It rises 1500 feet from everything that clusters around it and it says "planet" at the top and what more does one need? Well, maybe a route and there are not a lot on offer for this one. My chosen route starts a little way down the road from a rather nice camp site and, well, I'm already parked, so it starts at a rather nice camp site. From there, head southerly into a particularly large wash coming off the mountain. It will split at some point, take the left side there. A little further and the ridge comes down to a low spot on the left where I want to transition from wash to ridge, then right on up to the top. There is a rocky area that looks a little worrying along the way, but I'll just have to take it as it comes when I get there. There is also a little matter of the weather, which I neglected to get a prediction for and which seems to keep turning the more distant areas a little bit misty. My old weather report for a lot of miles north would indicate it will brighten up a bit, but that is doubly unreliable. Looking down Mineral Wash and trying to predict the weather with thick clouds, although the low sun has found the mesas. 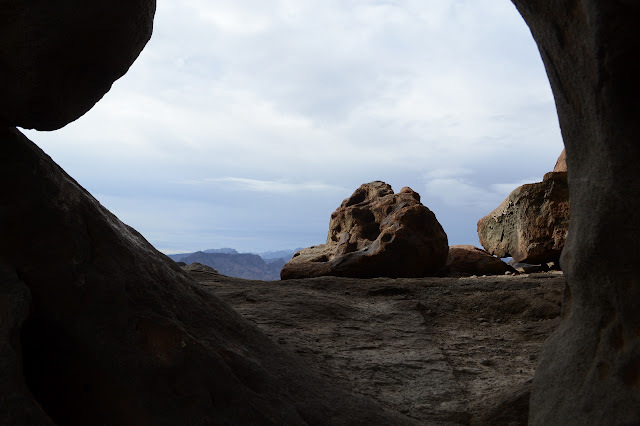 The mountains to the right of the sandstone caves appear shadowed by light rain. The clouds were spreading in the early morning and seem to oscillate a bit, but as the morning gets older, the wind picks up. A storm carrying a bit of rain tends to break up into wind instead, or so my experience says. But does that experience for a place of undoubtedly different weather patterns hold for here? It will be too late to start when I know for sure so I may as well get going. The target: Planet Peak centered on the wash that is the first target. 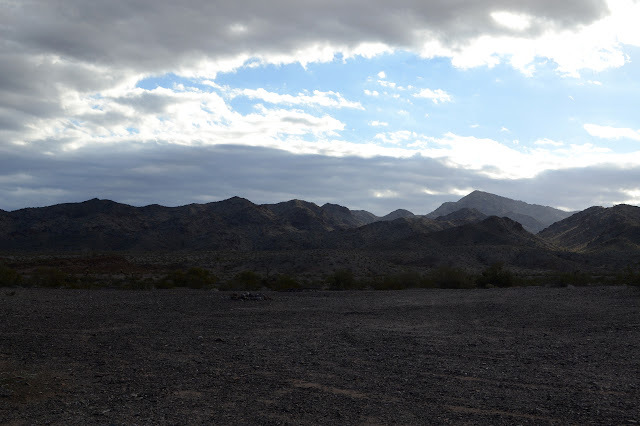 I walk down the road as it plunges in and out of washes until I can't stand it, about the second one, and start cutting across toward the wash that is the first part of my journey. The clouds are actually clearing fairly quickly although the source direction still has plenty to provide. I have not gone far when I find another road, but this one is going my way. 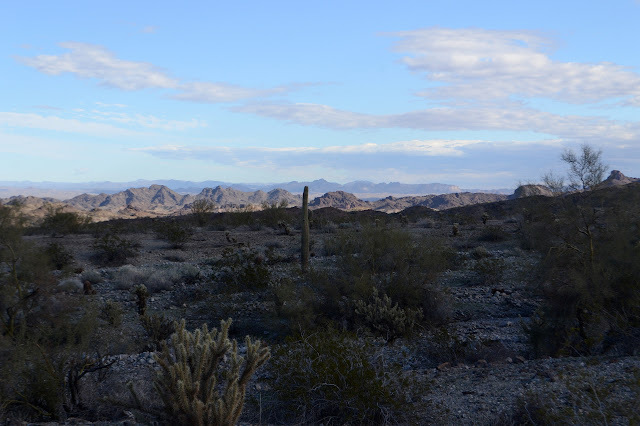 It ends at a loop and a campsite just before the transition from flats to foothills. Less and less cloud coming from the northeast. 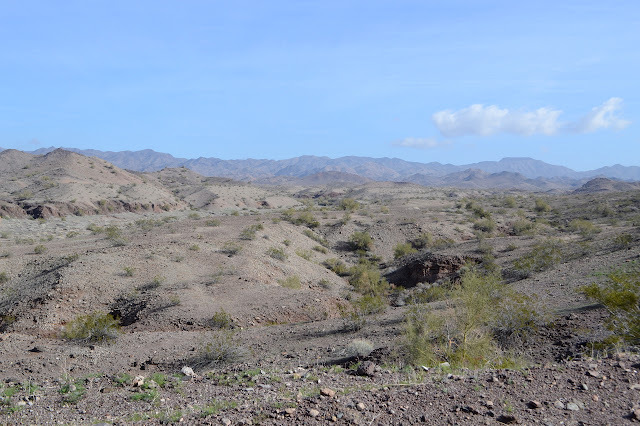 As the wash becomes surrounded by foothills. 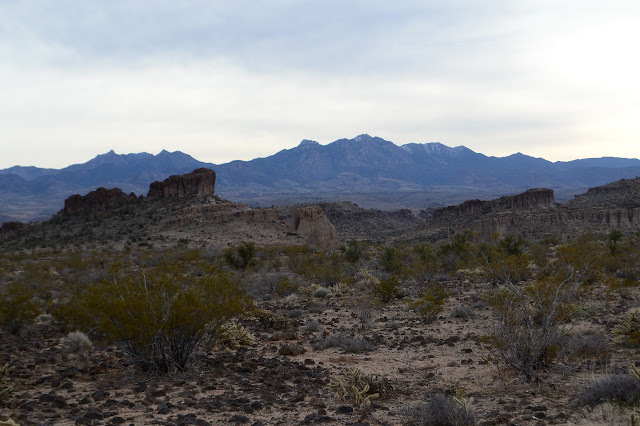 The cluster of three little peaks drew me to the area of Shea Road. I figured they would be quick to hike all together in a most, but not all, of the day sort of way. Antennas stand apparently to the west slightly of the top of the named one, Black Peak, which dampened my spirits a little, but one does come to expect this sort of treatment to peaks. 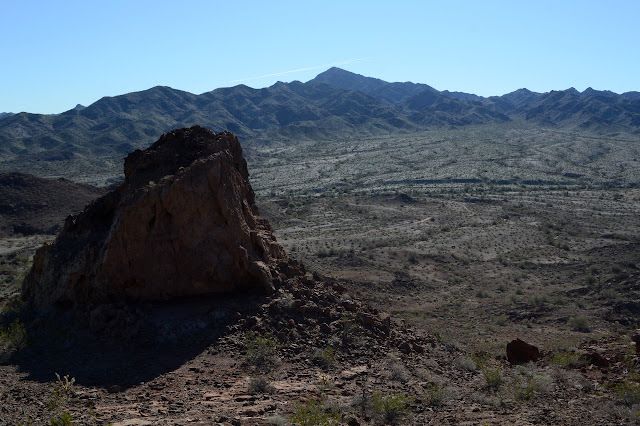 The boundary for the Colorado River Indian Reservation takes a corner up there, so it has potential for an unusual monument at the top. I parked by the one closest to the road in a spot where there weren't so many campers. Practically any place will do along this stretch of road. The first target, a peak that stands out from the other two a little to the east. This camping area was completely empty although there must have been at least 40 RVs on the other side of a little hill. The wash at the far side of my parking area is full of ATV tracks and the buzz of the things, mostly on tracks across the road from where I am, is nonstop. There are quite a few out. The far side of the wash is a steep hill and then nothing of these roads and ATV playgrounds except one track beside a gas pipe running above ground. It is not going my way. My way is up. I select a slope that seems to be continuous rocks dark with their satisfaction of being right where they are for my ascent. 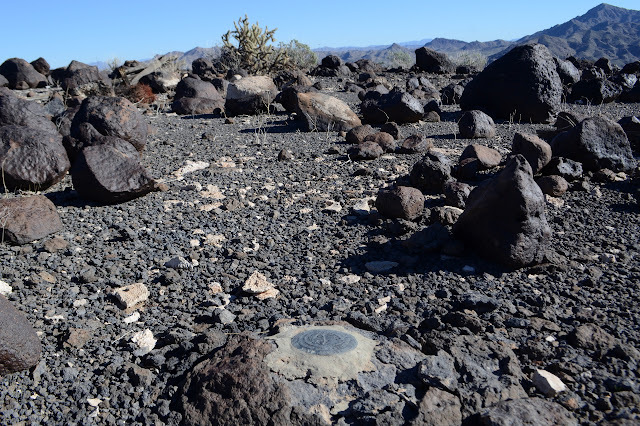 The black here is desert varnish and the rocks are actually much lighter where not exposed to weather, but very few of them show it. The route takes me past a claim marker, but that is what developed this road in the first place. A claim marker with a cryptic metal strip to indicate what exactly it marks. But the rocks it takes me past! Such wonderful bits of volcanic rock. It is all pocked with gas bubbles, but in some they are so numerous that it is almost like a sponge while others only have a very few marring their surface. The ones with only a few seem to have much slicker surfaces which I discover is not a visual trick after a few slips. 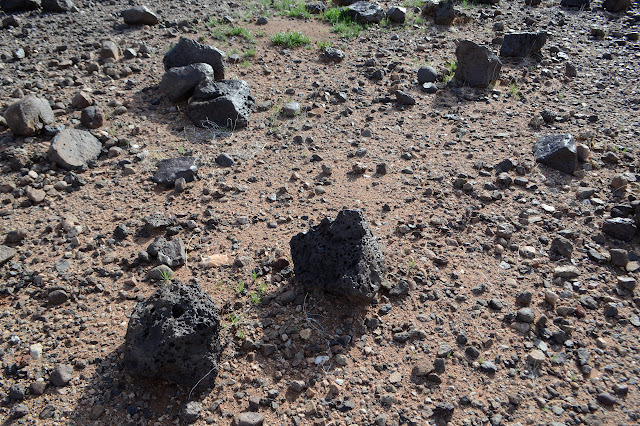 A little bit of the variety of scattered lava rocks from different levels of the flow. Looking down on the parked sources of a lot of the noise makers. 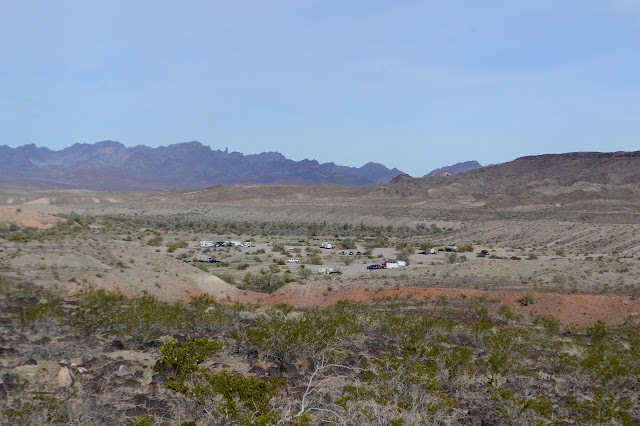 A popular area for both camping and staging. California across the way with its spires still seems to me like it's showing off. I just start chugging up the slope and the rocks are very cooperative. They are so very very black and not even showing chips from neighbors getting restless. These have been some settled rocks for a while although the slope is quite steep. When I come to slides that are all rock rather than rock embedded in dirt, they tend to be of a size that is very comfortable for the walking generally making nice sized steps. Northeast of the road is the Gibraltar Mountain Wilderness which looks like something of interest, but will get missed in this pass. Another day for exploring around the Aubrey Hills, but this time heading a little north to the Cattail Cove State Park. It is almost two miles up the road and, apparently since I'm just a glutton for punishment, I have decided to find a route under the power lines to get there. After all, power lines have their roads. First I have to get across the big wash I finished in yesterday. That is easy enough because there are two roads down into it on this side and one out of it on the other and although that one is washed out in one spot, it is not a sufficient blemish to keep a few people from using the road so I ought to be able to walk it. From there it is easy to find the road under the power lines and then more road climbing up into the nearby hills. Another flattened spot, but it's a nice view. Artificially flat. Today is sunny, but plenty of haze from somewhere. Road down from the flat at the top is a little iffy, but the ATVs have been managing, so I can too. That puts me back on power line roads. Being under the power lines and beside the highway, the Arizona Department of Transportation has given me a benchmark or two to stumble upon. Oh, and they've marked the section corner that I pass by a few feet, so I get to find that one easily too. It is another from 1915. The power line roads are discontinuous, but there is always something to follow through the steep little hills. 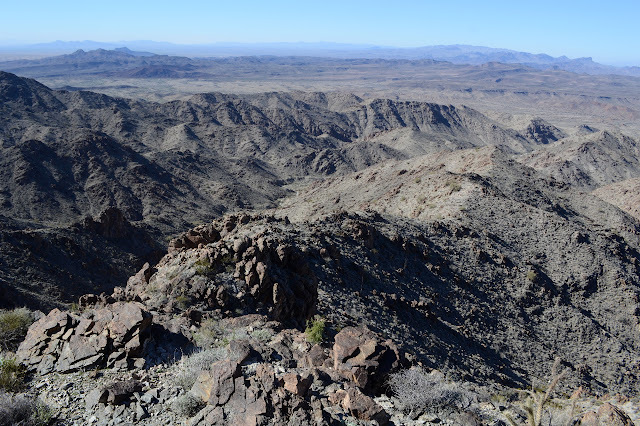 A little over two miles later, I am looking down on the inland side of the park. 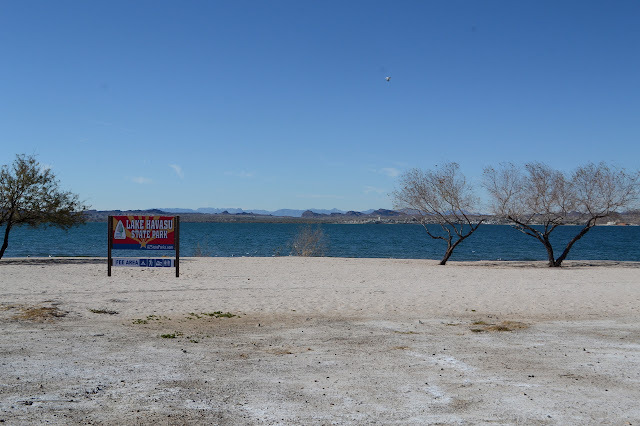 Or maybe in it already, there's no sign to say when and my map shows Lake Havasu State Park occupying a chunk that doesn't quite include the shore, maybe, so it's no help. 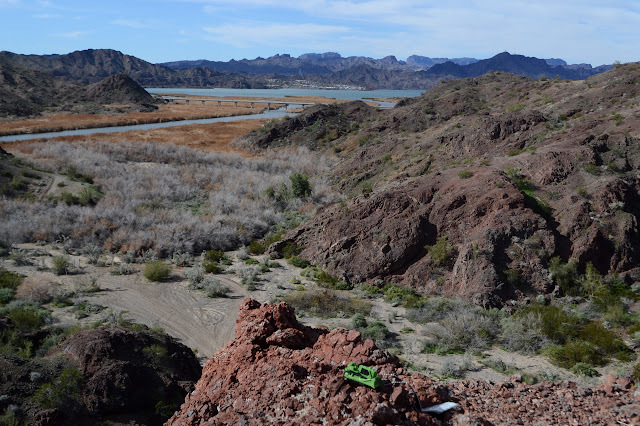 Looking down on the part of Cattail Cove State Park that is east of the highway. Today is just going to be a geocaching day. I'll follow them around and see where they take me. Most of them were set by the park itself. Now that I'm here, do I hike down to the river? I guess I should. This side of the highway is free, but the lake side is $3 to hike into, more to drive. Crossing the highway is made easy because the wash has to do it too. Following the wash down to the river. There is a trail with a sign on it a short way down. 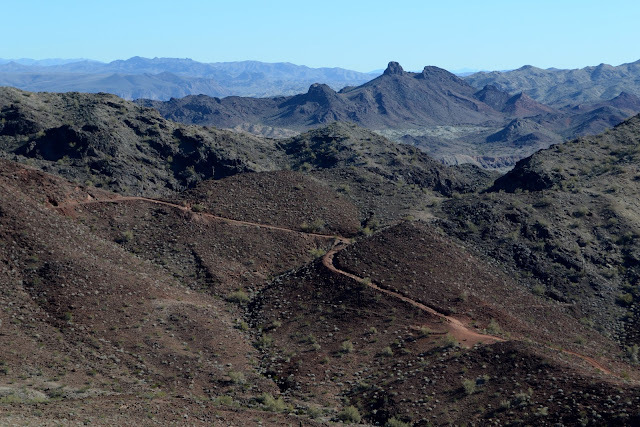 Destinations that sound like other trails are listed, all measured to the hundredth of a mile. Ambitious precision. Also a different way back. I just keep on plodding down the wash. (There's a geocache or two along it to sign and replace.) There is a bulldozer working on the last bit of trail into the hills beside the lake, so I have to enter into the more developed areas briefly before turning along the lake. It does take me past one more geocache than I was expecting. On the river. That is, lake. A little picnic area beside the boat ramp and steps up into the trail system. Today is a day for aimless wanderings, but I'm not very good at aimless, so I'll aim first for a rock some geocacher in 2005 thought folks should come out and visit (and indeed quite a few have since then) and then over to a selection of section corners that happen to be marked on my map. 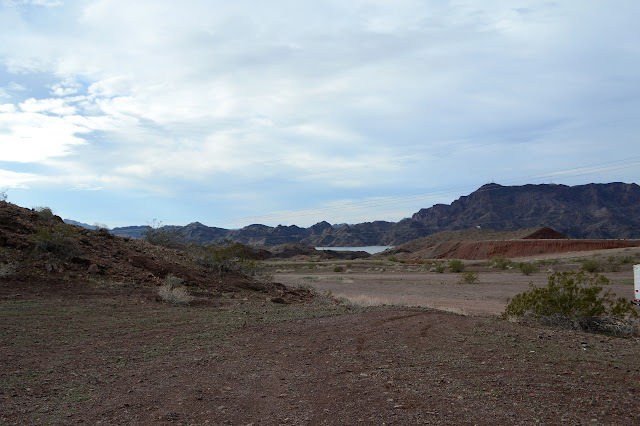 All this easily starts from wherever I happened to land the night before, which was south of Lake Havasu City. Something of the hills to the south has just been calling to me. 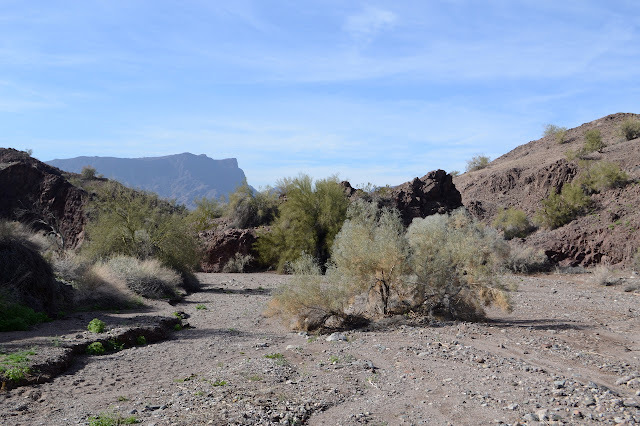 I had tried for something on the Bill Williams River, but the road was muddy and marked not for camping, so I came back north a few miles. It's an expansive spot that looks like some developer got started but never finished. The rumors that come to me from other campers agree with this impression and add that one of a pair might be in jail now. It's a bit far from anything for houses, but if you build it, they will come. Flattened expanses on both sides of the highway. The geocacher actually left sufficiently detailed instructions for getting to his rock including a parking spot in the wash just north of the one I'm in and then follow it around just so. I see an interesting line of ridge that leads to it, so that's my route. Road leads upward past narrow terracing and swings back to a flattened mountain top while another starts off toward the ridge only to stop suddenly. They won't get me far. Trail continues along the ridge after the road finishes, so I am not finished. Beyond it, nothing more seems cut and sliced, at least not by potential developers. A very pointy terrain ahead. 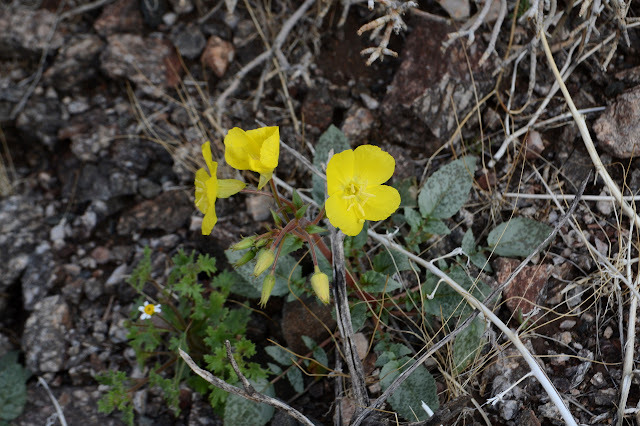 More flowers blooming after a spattering of winter rain. The trail fades quickly from a well used track to a game trail. 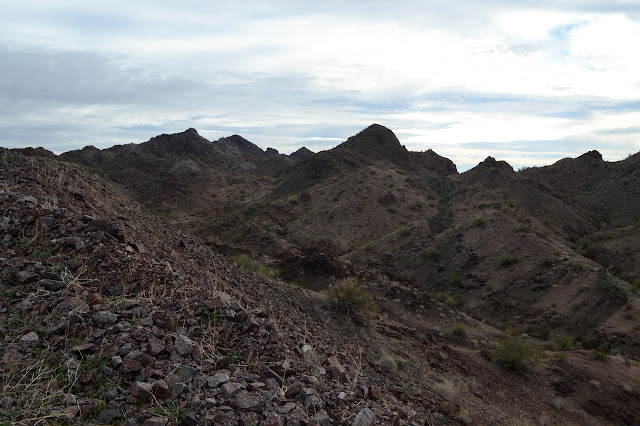 It is a tough trail to follow in spots and I tend to lose it around rocky ribs of the mountain. The slopes take sudden turns to being difficult to walk along, so I make my way down to the wash below where people have been driving. The wash suddenly narrows at a hard layer that has left big rocks on either side and I figure it is the end of the line for the drivers, but some of them actually do manage it. They probably go up and over one side. There are more and smaller constrictions, but at least one set of tires has managed them all. I climb out as the wash is getting as rough as the ridges but the ridges are getting smooth again. There is a game trail waiting for me to follow along. It splits and braids, and sometimes seems harder to see when on it than off it, but there always seems to be something making about the same route choices I make. 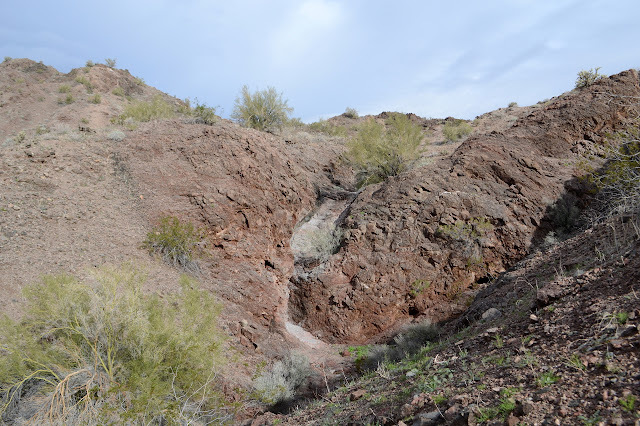 The wash splits and one side offers a lovely dry water course. 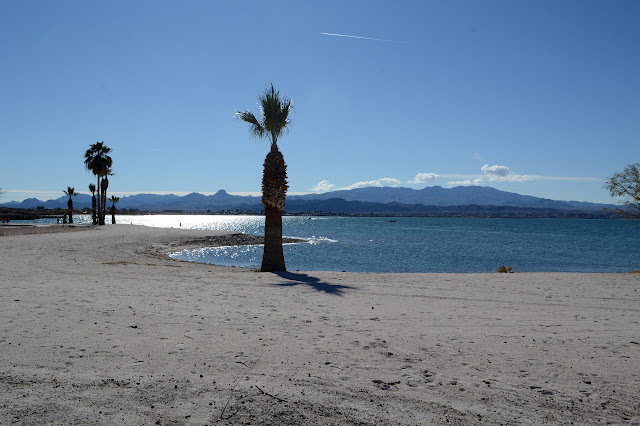 I must admit to feeling a bit uninspired by Lake Havasu. It seems like a place supposedly geared toward an outdoor life that merely tolerates me at its edges. It is full of big RVs and big boats and if you forgot yours (or just couldn't bring it while you flew in), there are a dozen places to buy some. There is a sense of a Disney World to the place that probably started long before there was one to emulate. 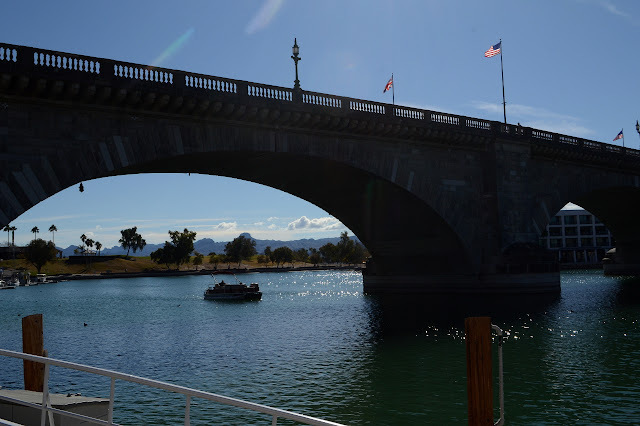 The London Bridge was purchased in 1888 and brought over in numbered pieces. It is actually only the outer stones of the bridge which were placed on a concrete structure, so it isn't quite so ostentatious as it sounds. Still plenty ostentatious. And you've got to see it. That's why he did it, so you'll come and see it. 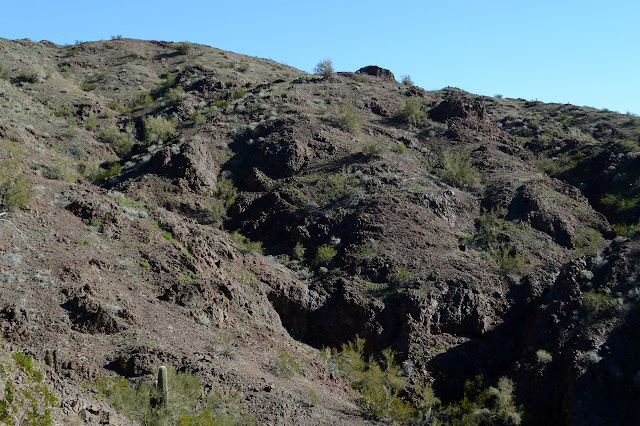 And there is sort of a way to do it on my own terms as part of a hike: via the Sunset Trail. It's right there in the AllTrails list. 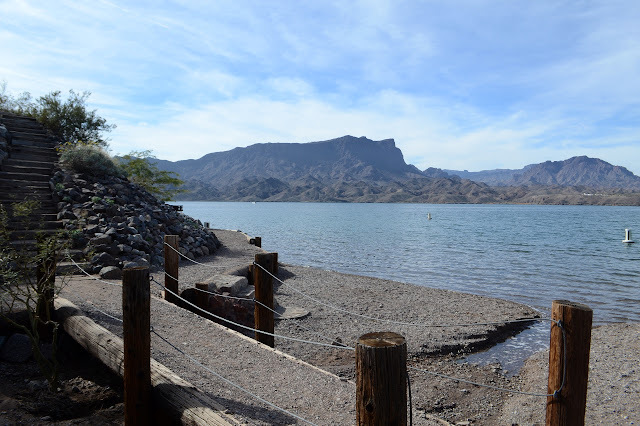 The state park wants $15 or $20 entry depending on the day. Signs, signs, everywhere, signs. Just so you know. Fee area. There's nothing unnatural about this beach at all. Sure the sand is pebbles at the water line but the palms might have a relative growing naturally in a few hundred miles. Move around the lot far enough, and I can find the trail. It has a nice big sign with a bit of information including a map. Behind it is a very wide sandy trail that is very easy to walk along. Information on plants and animals to inform the public and a map of sorts.